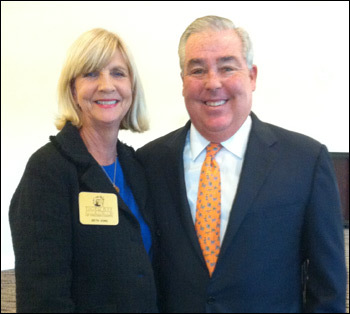 Rice & Rose Law Firm Attorney Beth King, pictured here with Attorney John Morgan of the Morgan & Morgan law firm, attended the March 11 meeting of the Tiger Bay Club of Volusia County. Mr. Morgan gave a presentation on the debate over legalizing Medical Marijuana in Florida. Over one hundred people attended the event at the Pelican Bay Club, which was sponsored by the Wholesale Lighting Company of Daytona Beach. Mr. Morgan is a fraternity brother of Rice & Rose Partner Paul Rice and a law school classmate of Partner Jim Rose.